Sleep is a wonderful thing. A good night's sleep has many amazing benefits since it basically works to reset your body, helping to strengthen the immune system, improve cognitive function and boost your mood. Sleep affects just about every bodily function and it also plays a big part in the appearance of our skin. Beauty sleep is real! I average 7 - 8 hours of sleep/night and I like to maximize the natural repair cycle by supplementing my skincare routine with sleeping masks. Sleeping masks or sleep packs as they're known in Asia are a popular K-Beauty product having a moment as a number of companies are now offering their own overnight treatments. A sleep mask is meant to be applied as a final treatment over your evening skincare as a way to lock in moisture and help your products to absorb better into the skin. You rinse it off the next morning and enjoy smooth and hydrated skin. Overnight treatment products are often formulated with a high water content so they're more lightweight than night creams and other types of facial mask since they're meant to sink into skin without feeling greasy or leaving residue on your pillow. Sleeping mask are not a must but I personally like to use them to boost hydration and to address skin issues. My first sleeping pack was the Laneige Water Sleeping Mask and that is like a total OG product. I think it's solid but there are so many other options that do more out there these days. This 97% naturally-derived creme mask is inspired by the Indian Haldi pre-wedding tradition where a homemade turmeric paste is applied to the bride and groom for glowing skin on their wedding day. 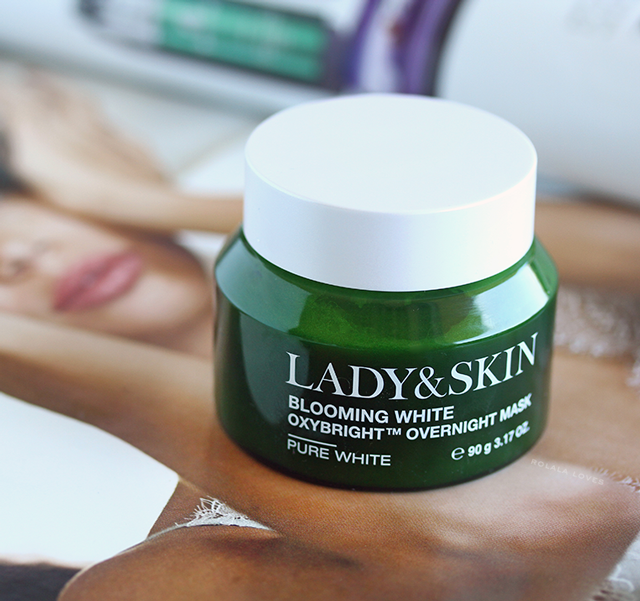 In clinical tests for this product, 100% of women exhibited brighter skin instantly with the use of this and the accompanying eye mask. Well I can say that mask delivers visible brightening. I had actually forgotten that I had used it the night before the first time and wondered why my skin looked so much better the next morning. It not only creates a radiant complexion but used over time it will help to firm and smooth the skin. There's nothing I don't like about this mask. It is unscented with a lovely weightless texture that sinks right in when applied and it works. Tulasāra means "moving toward balance" in Sanskrit. This product is essentially the Aveda Tulasāra Wedding Masque formulated for use on the eye area. It works to brighten and firm while diminishing the appearance of dark circles and puffiness with use over time. This is the first ever sleeping mask product I've ever used that is made specifically for the eyes but I was quite excited about it since I'm vexed by the occasional dark circles if I don't get enough sleep. Like the facial mask, the texture of this eye mask is like a dream and lighter than air. It is also unscented and stays right where it's applied. And the best part is that I wake up with well rested looking eyes even when I haven't had the best night's sleep. Not only has it helped with my dark circles, I also feel like it has improved the overall appearance of my eye area. Both of these can be found at Aveda and Nordstrom. I have previously reviewed this product and you can get the full details here. 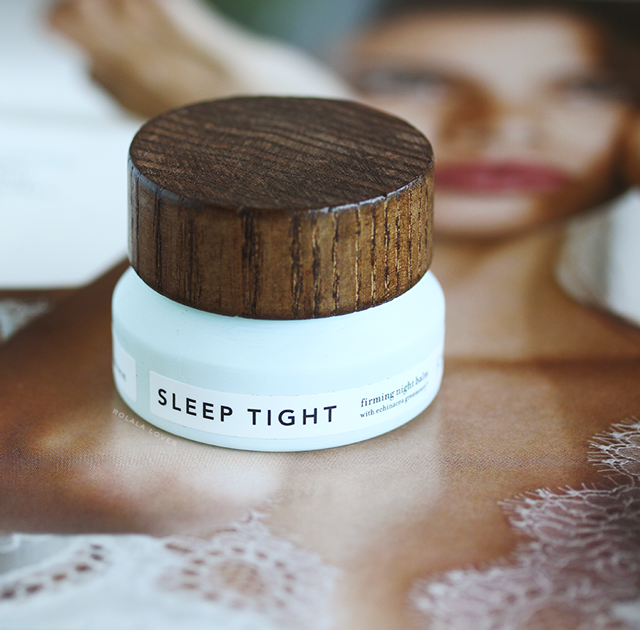 This is my second jar of the Farmacy Sleep Tight Firming Night Balm, a renewing night treatment made from farm grown botanicals that transforms into a gentle oil gel to moisturize, tone and firm. I was initially concerned that balm nature might make this greasy and while it does feel slightly heavier than any of the other masks I'm currently using, it does absorb into my skin fairly easily without any type of residue. And it's quite effective in terms of deep hydration and keeping flaking skin at bay when it's really cold. I find it also helps with redness. Because of it's richness, I do limit use of this one to the winter. This product is available from Sephora. As the name would suggest, this is an intensive overnight brightening treatment. It is formulated with by a complex of 8 natural botanicals, tangerine oil and oxygen bubbles which promote moisture retention and elasticity by helping to improve skin circulation. It has a faint citrus scent and this one is kind of fun to use. Out of the jar, it is in cream form when you apply it and once it sits on your skin for a few seconds, the oxygen bubbles activate and foam up after which you just work the product in with gentle massage. I saw some results after almost two weeks of using this product. It has definitely kept dullness at bay. I picked mine up at last year's Peach & Lily sample sale. It can be purchased online from Peach & Lily or RoseRoseShop. Get $10 off your first purchase at Peach & Lily. This product may look familiar because it was one of my recent loves. This nutrient rich treatment is formulated with natural camellia oil, lanolin oil, rose water, and fermented black ginseng. It has a lightweight feel and a pleasant light rose scent. I like this for how it effectively seals in moisture while improving the texture and tone of my skin and how pretty is that tube. I purchased mine from OhLolly and I've seen this for sale at Whole Foods. You can also buy it online through Amazon or Peach & Lily. Get $10 off your first purchase at Peach & Lily. Do you use sleeping masks? Do you have a favorite? I only have one sleeping mask, by The Body Shop and do use it at least once a week. But I rarely get to sleep 8 hours, or even uniterrupted with two small children. My son wakes at least once a night for a feed still. I will like to try Aveda wedding masque for eyes for my recent dark circle great review. Oh wow Rowena, I've never used a sleep mask. Funny that u write about sleep cos right now I can't sleep and its 3:10am so I'm up reading blogs haha. I should give one of these a try though, sounds great. Need to have this asap. Oh so many good options! I didn't realize that Aveda had some good ones out there. I'd definitely want to try Lady & Skin as well. It looks fabulous! Wow, this sleep mask sounds great! I LOVE sleeping masks!! I did a post on them once, but some of these are some new-to-me additions!! That sounds great, sleeping my way to better skin, well I've never used a sleeping mask before, I suppose I need to change that immediately. Happy new week, Rowena. 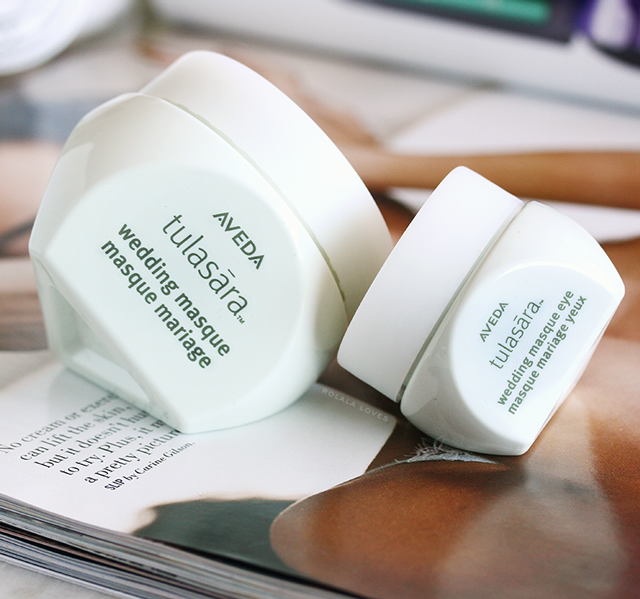 The one that I am most interest in is Aveda Tulasãra Wedding masque. I have a spa here that sells Aveda products, I'm going to check if they carry this mask because it sounds heavenly and I know you won't steer me wrong. Oh these all sound good and eye one has me quite interested as my problem is puffiness for fluid retention under the eye, very hard to combat. I have not used a sleeping mask before, but as long it does not make my eyes puffy I would like to try them. My skin has been on the fritz lately. It was great for eight months, no big breakouts, no dryness, no issues, but last month my skin rebelled and I’ve been dealing with pimples like crazy, when now goes away another one pops up. I’ve heard of sleep masks, but have never try them. I think it’s time to bite the bullet. 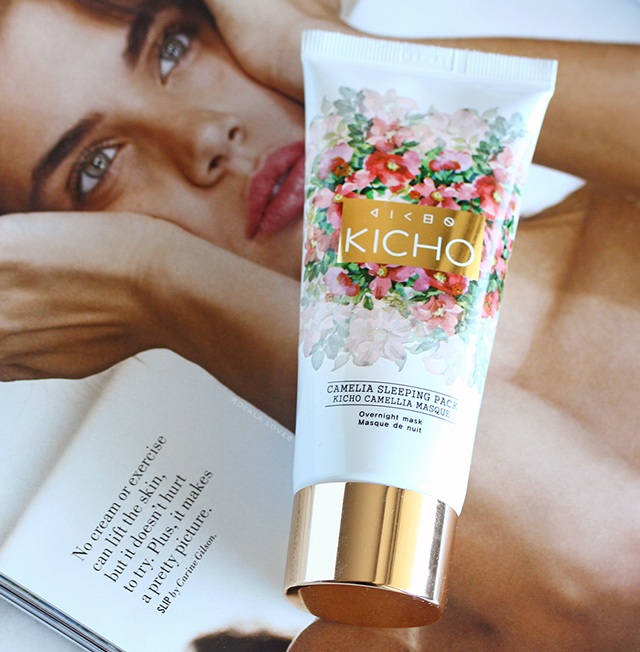 I love Peach and Lily; I’m going to try this Kicho Camelia Masque. Rowena, I remember when you tried Laneige! I haven't tried any sleeping masks yet, but I've been bookmarking them on my wishlists at various stores. I'm happy to say some of these were on my lists :D Now I also want to check out the Aveda ones. They seem lovely. Thanks for this post. As always you stay ahead of the game. We really need to invest in our skin esp. our night time routines. Love this post my dear! Lovely outfit Virginia! :) I'd wear this vest look too, in an office! Beauty sleep is most certainly real. I have a sleep cream and I just started using a recovery masque as well (actually just talked about it on my blog today). I have never tried a sleeping masque. Those first two seems lovely ( the wedding masque and the one for the eye area) and I'm happy to hear they are working out for you. It is always great when we can find a product that really makes us a difference. I do agree that beauty sleep is important. When I don't get enough sleep, my skin always starts to act out. Sometimes quality matters too. There is nothing better than peaceful and energizing sleep but sometimes my subconsciousness has other plans! Lady and Skin Masque also sounds lovely...and that Kicho Sleeping Pack seems fantastic...and how cute is that tube packaging! I love all the cosmetics you have show us. I would love to try them. 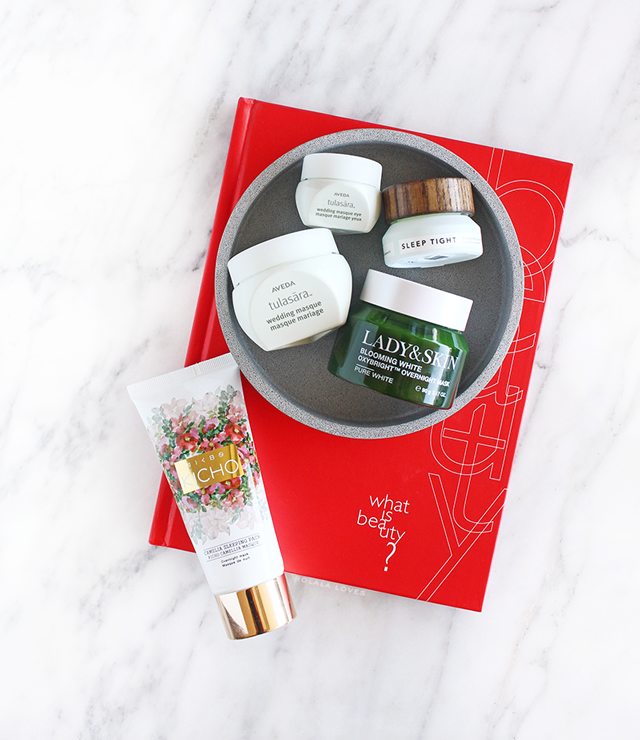 It's good that you are talking about sleep masks and balms here because I have recently been using more. Sleep is so important, honestly, because when we continually don't get enough, it can take years off of our life. I try to get 8 hours of sleep but that has changed due to my crazy schedule so I try to sleep a lot on the weekends. I have been wondering about the Lady & Skin mask so thanks for sharing your thoughts. First of all, I love the title of this blog post! Secondly, the rose scent of the Kicho Camellia Sleeping Pack sounds SO beautiful - and I love the product's packaging.